Organisers of a motorsport event are moving its annual festival to Anglesey because they say the backdrop of Snowdonia will add to its attraction. 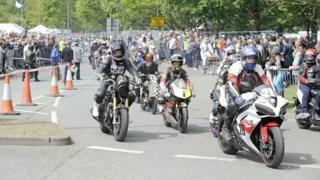 The Thundersprint motorcycle festival is relocating from Cheshire to Anglesey Circuit in April 2013. The event, a celebration of classic and modern machines, has attracted up to 130,000 visitors over two days. Proprietor Frank Melling said he wanted the event to "slip in to the Anglesey tourism programme". The two-day Thundersprint festival attracted riders from all over the world when it was held in held in Northwich town centre. Some of the town's roads and the central car park closed to general traffic to allow racing and stunt displays to take place. This year's trade stands and static displays on the final day attracted a six-figure crowd, said Mr Melling. He said he and his wife were moving the event to Anglesey as that would "take the Thundersprint on to the next level". He said: "We're convinced that the venue is world class. We love the ambience of the island. "Anglesey as a setting is is a sleeping giant. It's not well known. "Anglesey Circuit is one of the world's great circuits. Its 2.1 miles of superb track enjoy one of the most spectacular settings anywhere, overlooking Caernarfon Bay with views stretching all the way to Snowdonia. "The facilities are superb too and the welcome we have been offered has been outstanding. "In short, the Anglesey track will take the Thundersprint on to the next level." Mr Melling said if the newly-relocated event attracted 25,000 people, that "would be a huge event for Anglesey". He said: "We would like to see the Thundersprint build gently, calmly and effortlessly towards the figures we have had previously. "I want the event to slip in to the Anglesey tourism programme calmly, so everybody is comfortable with the experience". Thundersprint would be aimed at attracting local visitors as well as those from further afield, he said. Anglesey Circuit operations director Richard Peacock said: "The Thundersprint is acknowledged as one of the great motorcycling events in the world and we intend providing a setting worthy of a festival of this status. "Not only do we have a superb track but we also have great spectator facilities including a beautiful campsite. "There is already a real buzz amongst our staff at the thought of having the Thundersprint here and we just can't wait for next April."